Located in downtown Rome, Georgia is City Creamery. They serve ice cream, frozen yogurt, shakes and have a full service coffee bar. There’s something for everyone as they even offer gluten free options, vegan ice cream and shakes. City Creamery operates out of the building that the historic Rivoli Theatre - the oldest movie theatre in Rome (two original movie chairs and poster adorns the shop). They also offer old time candies such as peppermint sticks, divinities, pecan logs and old-fashioned all day suckers. A small portion of the shop hosts a retail selections of coffee’s, t-shirts, car plates and other small souvenir type gifts. Did we mention they have free wifi? 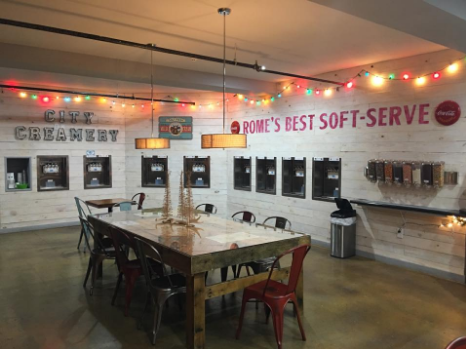 Before opening City Creamery, the owners had a previous frozen yogurt shop using CCS in 2015. 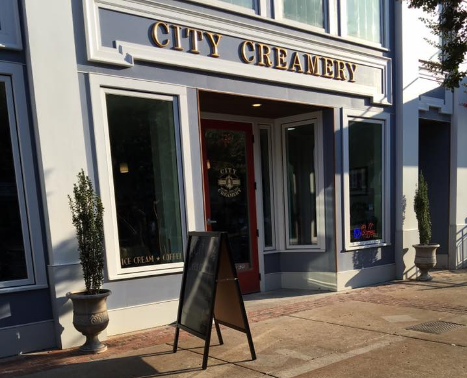 So in 2016 they decided on using CCS again at their new City Creamery shop. City Creamery uses two terminals with integrated scales and 8” LCD customer displays. Since the scales are integrated, CCS reads the weight from the scale and calculates the price. It also includes taring the cup so that the customer isn’t being charged for the weight of the cup. Barista’s at City Creamery can easily modify drinks within the POS, whether it be by milks, shots or syrups. Label printing for the cups are an optional feature. 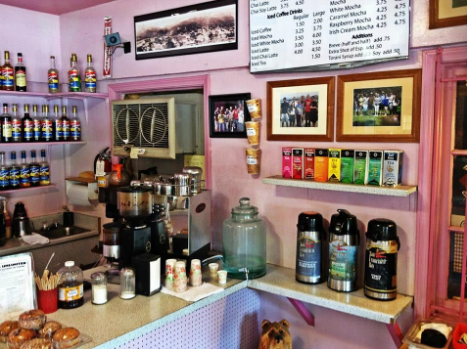 With CCS Item Builder feature, City Creamy can track their coffee bar’s inventory and associated costs. For example, City Creamery can enter a drink recipe into CCS that lists the ingredients of the item and their portions. Even the cups for the drink can be added to the recipe for added cost insight. All of these sales and their cost/profit margins are tracked in CCS and be accessed by using Cafe Cartel’s analytics features and 70+ reports. Their retail items can easily be uploaded via an excel document or manually entered. Tags, label or barcodes may also be printed for the gift items if so desired. Cafe Cartel comes with complete managerial oversight which includes, special permissions, employee time clock, labor scheduling, remote login and multiple cash drawers. At the end of the day, reports are emailed to managers though they can remote in periodically to check sales if they are working off site. Security systems may be integrated with the POS so that the feed can be pulled up by order to insure there is no employee tampering going on. These are the reasons that many business owners choose Cafe Cartel, just like City Creamery. To review these things and more, call 866-973-8099 or request a quote today. 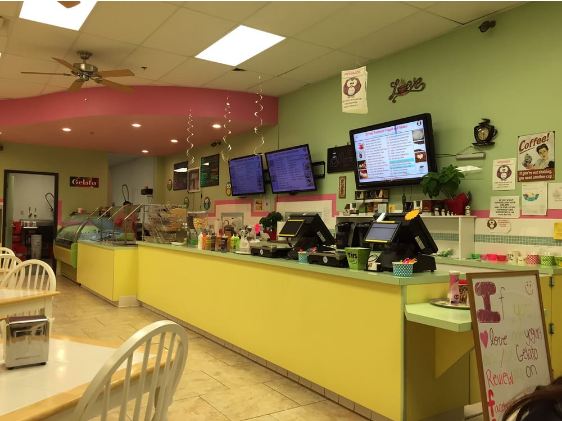 Located in Santa Maria, California is Ozzie’s Premium Yogurt & Gelato. Ozzie’s is a family owned and operated business who prides themselves on providing over 18 frozen yogurt flavors and 19 gelato flavors. Their handmade gelato is an old family recipe, that includes only natural ingredients. Even their business name comes from their family - their pet parrot Ozzie. They also serve cake pops, boba tea, smoothies, coffee and frappes. In early 2014, Ozzie’s spent months preparing for their grand opening. One of these tasks included finding a POS system. Since Ozzie’s had owned other previous businesses, they were more familiar with POS and it’s benefits than some first time owners are. They required a system with integrated scales and a UPS battery backup. This is when they found Cafe Cartel Systems - a leading provider in the frozen yogurt industry. With thousand of installations across the world, CCS provides NTEP approved, integrated scales and optional accessories including the uninterruptible power supply (UPS) battery backup. With various hardware options, Ozzies was able to choose the system that would best meet their needs. With CCS, Ozzie’s is able to issue and track gift cards for their store. They also have an advanced loyalty and rewards programs to offer their customers. This is especially important considering that the industry thrives off of creative promotions and repeat business. There is both “Buy X, Get X Free” and a loyalty points program. These programs can be assigned to magnetic cards or by email or phone numbers. CCS software tracks all of the purchases the customer makes and what they in turn, earn for their repeat business. For example, points are accumulated for each purchase. Customer can see their accumulated points on the customer display and the cashiers can see them on the order terminal. Customers can choose when they want to apply their points to the order or reserve them for future credit. Once the receipt is issued, the total amount of points will be printed at the bottom for the customer’s reference. To review these features and more, call 866-973-8099 to speak with an industry consultant or request a quote today. Dispensaries in Long Beach What Point of Sale do They Use? 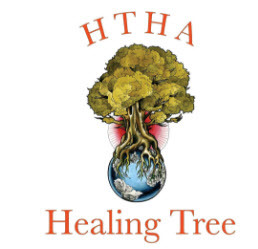 Located in Long Beach, California is Healing Tree Holistic Association. This medical marijuana collective delivers in the local area and provides their patients with quality medication at great donations. Healing Tree is renowned for the compassionate care and timely service to their members. Established in 2011, they have continued to operate their collective successfully. From flowers, to concentrates and edibles, Healing Tree has everything to meet the needs of their patients. In 2014, Healing Tree required a more sophisticated POS solution to operate within their regulations. They desired one that had intuitive delivery features and one where they could provide their own hardware. Essentially, they wanted to purchase software only and use it on their current computer system. While they were only a delivery service, they were hoping to open a storefront in the near future. So they needed a system that they could grow with and could handle a brick and mortar collective as well. This is when they came across Cafe Cartel Systems - a leading POS provider to the industry. For collectives using CCS, the patient will receive an email of the impending order information as well as the total and who is delivering the order. The driver will also be notified that they have a delivery they need to make. This email will include the patient’s information as well. From the POS terminal, associates can assign a driver to the order by selecting the “assign driver” button. From there they can select the delivery person. This will then send out the emails to both patient and driver so that they order can be completed. Healing Tree Holistic Association was also pleased that CCS software can be purchased separately so that they could continue using their current computers. Cafe Cartel provides full solutions to collectives across the states and Canada - both delivery and storefront. With all three of their needs met, they ordered the software and were set up and trained after only a few appointments. CCS also offers NTEP approved scales and meets the metrics and limits of each state. Additional features include inventory, reporting, data encryption, loyalty programs and grow tracking. This secure system is prevents tampering, exposing the system to hackers and locks down from raids. To review your collective’s needs with an industry consultant, call 866-973-8099 or request a quote today.